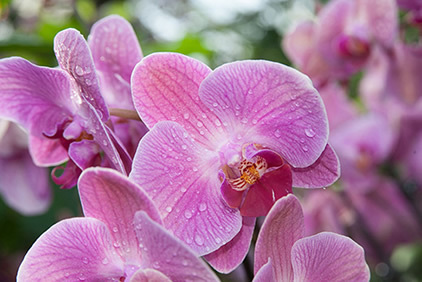 In the midst of a bone chilling winter, tropical colours abound at Kew Gardens, heralding their annual Orchid festival! Few things thrill the senses and elevate the spirits like flowers in full bloom, and taking shelter in the steamy surrounds of Princess of Wales Conservatory, laden with delicately over-spilling floral delights is sure to banish any lingering post Valentine blahs. As the sublime blooms glowing here oft originate from far flung regions, Orchids offers a truly unique and welcome opportunity to savour beautifully distinctive flowers, in a rainbow of colours, from around the world. Kew Gardens’ Princess of Wales Conservatory, named for Princess Augusta, mother of George III, who founded the Botanic Garden in 1759, was opened by late Diana, Princess of Wales in 1987. Spanning ten climatic zones encompassing cacti, ferns and carnivorous plants, in addition to orchids, the fuel efficient Conservatory was designed to replace twenty-six tropical herbaceous plant houses in the Gardens that were then in decline. Its’ two major zones, wet and dry tropics, head several smaller areas for species requiring more specialised treatment, and the species further are divided into groups according to their native temperature environments. 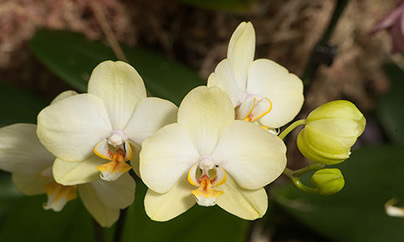 As signs among the flowers proclaim, ‘Hybridisation of orchids has been big business since the 1850’s and the new species required to breed new hybrids fetched high prices in the 19th century.’ To illustrate that fact, in 1890, it was reported that £1,500 had been paid for a single orchid, the equivalent of £96,500 today! 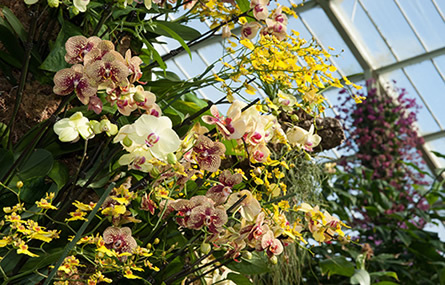 The spectacular orchids found in Zone 1 of the Conservatory are not from the Gardens’ resident collection, but stunning hybrids, among the most spectacular available. The flowers which seemingly, bloom from tall pillars, a pond also harbouring the sacred Lotus, and all manner of baskets and bowls are sure to enchant and delight. A staggering 3,000 hybrids emerge annually and the resulting flowers are, understandably, of great commercial value. Having worked with suppliers of hybrid orchids over the past 18 years, this year’s collection represents some of the most unusual and, beautiful examples ever shown. Kew Gardens has the distinction of housing the oldest living orchid collection in existence, as those exotic blooms, now numbering in their thousands, with 1,500 species represented, many of which are endangered, have been carefully tended there since 1770. History aside, as we made our way through Tropical and Temperature Zones 6 and 7 of the Conservatory, shedding layers along the way when humidity climbed in accordance with the needs of neighbouring flora, we were increasingly astounded at the colour, magnificence and unabashed perfection of orchids of varying shapes and sizes, above, below and around us. At first sight, to the untrained eye, prominent among them, perhaps, are iconic pinkish purple varieties of the colour ‘orchid’, but the sublime throng also includes classic whites, firey reds, oranges, yellows, featuring freckles and subtly contrasting tinges, striking purples with tiny circular patterns, only visible via sun glow, and shyly coloured fawn blooms, conveying the feeling of a spring morn. Some varieties are earthed, while others grow on high, sans soil, seemingly thriving in mid air, roots exposed. Carefree, obviously in their element species cascade merrily down surfaces, as naturally as so many ripples in a tranquil stream. ‘Beauty too rich for use, for earth too dear,’ as Shakespeare wrote. With names like ‘Ginger Snaps,’ ‘Red Ruby’, ‘Surf Song,’ ‘Passion Fruit’, ‘Stairs to Heaven’ and ‘Dazzle,’ and markings and hues to match, viewers are bound to become orchid enthusiasts, if they aren’t already, and one hankers to house such charming flora. However, with two curious, plant inspecting cats at home, my mind’s eye will just have to suffice, until next time. Meanwhile, there are always, untold natural wonders unfolding, year round at Kew Gardens, whatever the weather!